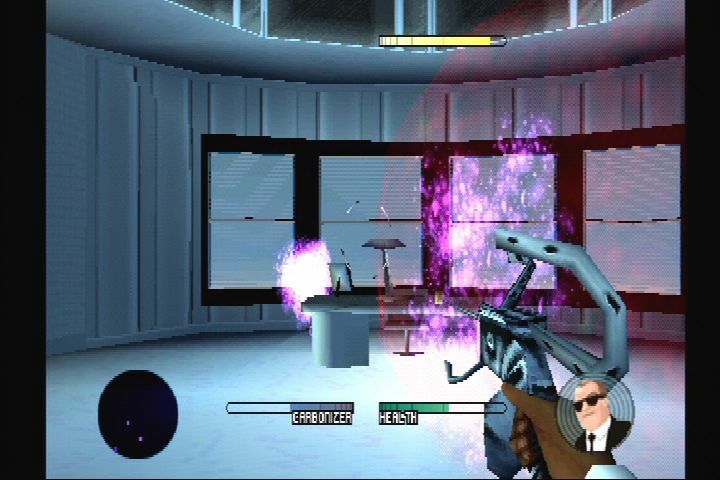 As big as 1997’s Men in Black was, North American console only gamers wouldn’t be able to play as a member of the elite, shadowy, alien policing organization on a home console until a year after the PlayStation 2, and it wouldn’t even be on the PS2, but rather the original PlayStation. Like the MIB’s debut Game Boy Color game, the premiere North America console game was based on Men in Black: The Series and not the 1997 movie . Just because Men in Black: The Series – Crashdown doesn’t carry the more prestigious movie license doesn’t make it a lesser product however, as Crashdown is easily the best game to carry the Men in Black name. Despite having a few issues that keep it from being a must play, Crashdown is a game that’s surprisingly held up reasonably well and is maybe worth tracking down if you’re nostalgic for the license or have a fondness for quirky first-person shooters. 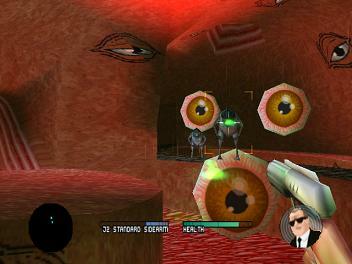 Like the two Game Boy Color games that came before it, Men in Black: The Series – Crashdown doesn’t have a traditional narrative that stretches from the start of the game through to the conclusion, but instead is broken up into small, three level chapters called “Syndromes” (ten in total, counting a brief tutorial level) that each have their own mini-campaign. Where this succeeds where the Game Boy Color games didn’t (and even the final game based on the cartoon for the Game Boy Advance) is that the layout truly embraces the episodic nature of the show and makes this game feel like a mini-season. A Syndrome will introduce a villain and a conflict that either Agent’s J or K will have to resolve and like a serialized show, some villains from earlier Syndromes will return and even team up. Syndromes are set up by FMV cut-scenes that have not aged well with weird character animations and grainy video. Cinemas may have been a bit more tolerable had they actually gotten the cast from the series to reprise their roles, but everyone from the series is noticeably absent. The voice acting accompanying the cinemas is serviceable, but when compared to a game like Batman: Vengeance that released in the same month as this and had both Kevin Conroy and Mark Hamill record new lines, that level of authenticity is sorely missed. The best thing about the episodic nature of how the narrative is structured is how it allowed for the developers at Runecraft to get creative in designing levels. The Men in Black agency is situated in New York, and you do get some of those classic video game trope stages like warehouses and docks, but those are mixed in with gigantic alien spaceships that are like something straight out of Turok 2: Seeds of Evil. My favorite Syndrome has Agent J being shrunk down to stop a race of tiny aliens so part of that chapter just has you in a backyard where things like blades of grass and cans of soda the size of buildings. The Men in Black license is one where you can really do some creative things and I’m glad to see that Runecraft embraced this, which is a problem that most games set in this world fail to do. 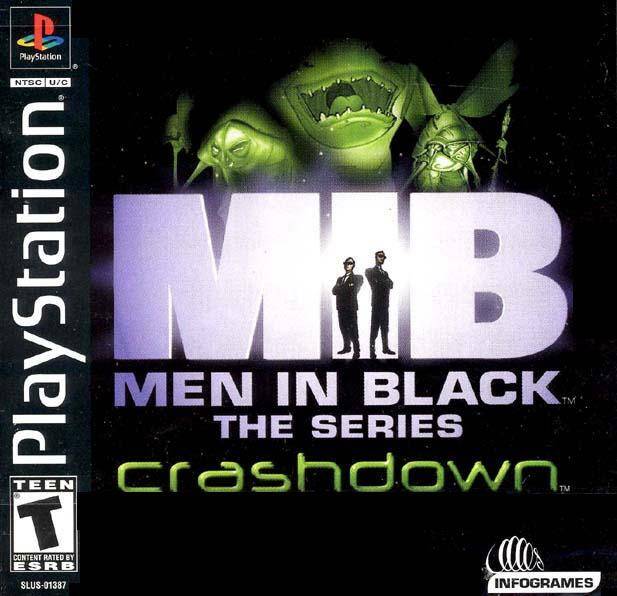 When you think of first-person shooters from the 32-64 bit era, the original PlayStation was not as well-known for the genre as the Nintendo 64 that had classics like the Turok series and GoldenEye 007, but Men in Black: The Series -Crashdown is a respectable entry in the genre provided you don’t go with the default control option. Developers had some growing pains before dual-analog aiming and shooting became the standard and wrapping your head around the original intended control scheme that requires you to strafe with two triggers, movie with a stick and aim upwards with another was too much for even a person like me who grew up with this weird controls. Thankfully there’s an option that closely mimics what most people are used to now where you can aim with one stick, move with another and shoot with a shoulder button. While you can get the controls to a place where you’re easily moving and shooting, they still don’t feel quite as refined as something like you would find in either a GoldenEye or even the original Turok where enemies reacted depending on where you shoot them. Instead you have an aim-assisted, almost lock-on mechanic where if you move your cross hair over an enemy, it snaps to them and then you shoot them until they die. This is fine in the earlier stages where both ammunition and health are plentiful, almost too much in fact, but in later stages where things get fairly difficult, you really wish that there was a faster way to take out enemies for aiming for certain parts like a head or leg. You play as both Agent’s J and K but neither have a distinct advantage over another and you can’t choose between them either, instead the Syndrome picks them for you. As the game is in first-person, it doesn’t really make that much of a difference anyhow. Men in Black: The Series – Crashdown has a pretty fair difficulty curve where the game eases you into things, almost luring you into thinking that the entire game will be a breeze, but the later stages can get incredibly frustrating. Where health and ammo were both plentiful, suddenly they become scarce to the point where you have to run through a stage multiple times making mental notes of when aliens will pop out, where health and ammo are located, and the best use of each gun such that you don’t waste your heavy artillery on normal stage enemies. As creative as the themes of the levels can be, the same cannot be said of their layout sometimes. There’s a lot of stages that have very tight corridors where it’s often too hard to strafe around and shoot effectively, often leading to you getting trapped in a corner, swarmed and then eventually killed. This game features no checkpoints within stages and death carries a hefty penalty of having to start entire stages over. This is not so much an issue early on, but later levels, especially ones where you have to protect someone with precision shots the controls don’t offer or run away from an indestructible boss a nightmare. Thankfully though you do have quite the arsenal to combat the scum of the universe with. They’re derivatives of typical FPS armaments like a pistol, shotgun, mini-gun and rocket launcher, but they have a design and feel unique to this game. The way ammunition is dealt out for example isn’t from enemies dropping bullets or picking up clips in the environments, but by using recharge stations. In levels like when you’re in the MIB headquarters they’re designated stations in which to do this, but outside anything goes from a battery in the level where you’re shrunk or a soda machine when you’re out in various areas of New York City. Though aiming isn’t quite as good as what it could be, the feeling of shooting your guns is. Each carries the right amount of weight, like the noisy cricket that kicks you back and my favorite weapon, the mini-gun, that makes your controller vibrate to the point where it feels like you’re actually shooting. Though it has some questionable looking cinematics, the overall graphical design of the rest of the game is pretty good seeing as how this came so late into the PSOne’s life cycle. You unlock a map for each stage but they’re designed in such a way that you’ll never get lost and you know instantly what can and cannot be interacted with. The aliens you fight within stages have enough variety, but they also tend to repeat and a few more would’ve helped to make the moment-to-moment combat a bit more interesting but is helped by having some interesting bosses like the hybrid Agent Alpha. As far as music goes, this game only has a few tracks that repeat so it’s best to keep the volume low on your TV. 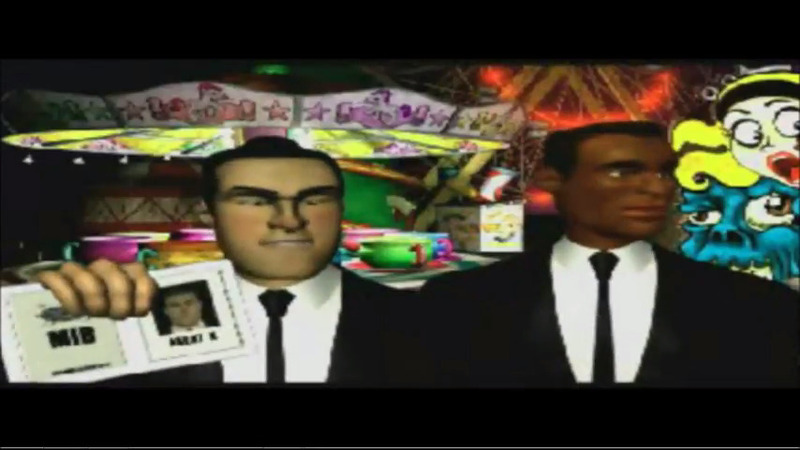 Men in Black: The Series – Crashdown isn’t a lost gem, but it holds up decently well for a pre-sixth generation console era shooter through the creative use of the Men in Black license. The aiming could be better, but the act of shooting feels right and the episodic structure of the game will make you want to keep playing despite some difficulty spikes to find out exactly where you’ll go to next. There are Men in Black games that came after Crashdown on far superior hardware, but for fans of the franchise, this is the best Men in Black title ever released on consoles in North America.